Verdict - An interesting movie that could have been sharper and more ruthless. The lady judge looks like a school headmistress as she looks at Arjun Rampal ( Arun Gawli) and announces "I should give you death but I am giving you life". I half expected Arjun to say " Thank you your honour". This scene ended my ordeal of sitting through this mish mash of a collection of individually well shot scenes but the end result is a listless narrative boring at many places. Director Ashim Ahluwalia seems to be heavily influenced by the shooting style of RGV and the film is reminiscent of Satya and Sarkar series in many places. The biopic leans heavily on the oft repeated formula of the innocent Mumbai chawl boy sucked into a life of crime due to circumstances. We have seen this often.The police are shown ruthless and crafty and hand in glove with local politicians. As he learns the tricks of the trade Arun slowly evolves into a local messiah and Robin Hood of the masses. However the law catches up with him and he gets life imprisonment. The director is able to give the audience the feel of the dingy chawls and dark police stations and nasty police inspectors conducting third degree methods of investigation. Daddy is purported to be an incomplete biopic of a gangster Arun Gulab Gowli ( Arjun Rampal) who reigned the underworld turf for two decades(80-90s).Why incomplete? Partly because the character is still alive and partly because the story is told only till 2012.May be there could be a part 2 in the near future. Being a gangster film ,it has all the elements - why do poor and humble people indulge in crime? why are they mavericks? why do they derive sadistic pleasure in senseless shootings? why is their family life chequered? why do they continue to be stigmatised even when they have atoned for their acts? The presentation of the story is so realistic as if one is viewing reality.The performances by all is so powerful that it leaves an impact.The screen play has been well researched.Minute details of the period have been taken care of.There is swiftness and suddeness of shooting sequences . The characterisations of two dons( Gawli) and Maqsood( Farhan Akhtar) makes us believe that the underworld got polerised on communal lines.The cops seem to be working more as the front men of the dons rather than doing their duties impartially.Nishikant Kamat( Vijaykar Nitin)remains partial towards Maqsood. A special mention needs to be made for Aishwarya Rajesh( Zubeida aka Asha) the suffering wife of Gawli and a single parenting her daughter .She is superb. No criminal act can be justified merely because the circumstances are rough.Means are equally important as the ends. Those who live by guns ,die by guns. The nexus of politicians and the criminals must not be allowed to exist.For this the cops have to be impartial. A criminal needs to be 'socialised' and not ' ostracised' a la the assembly members who all spoke against Gawli despite he been elected as an MLA. Despite being a gangster ,one empathised with the plight of the criminal post the birth of a daughter. Daddy had all the ingredients. A good actor like Arjun Rampal who has a screen presence and looked every inch Arun Gavli. Some very good side performances like the one from Nishikant Kamat.A decent enough background score. The movie is however more of a docu drama. It never really gets into the drama pitch of a gansgter movie. It never really gets to the thrill value that the gangster movies of RGV style in the 1990s. The movie has some moments and some narrative before interval which is totally lost post interval. The presentation of the entire movie is kept subtle and you expect the movie to shift gears but the feel remains that of driving a car in the second gear for two hours. Daddy is a political drama on the life of gangster Arun Gawli. Yet the film offers nothing substantial despite a strong cast. The film is a stereotypical gangster film, where there are high octane action scenes, item songs and lots of running around. Despite the sepia overtones and the gritty landscapes, the film fizzles out. 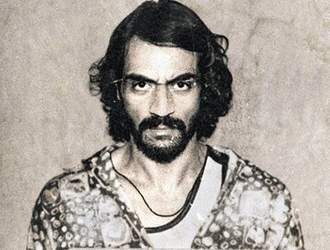 The film offers nothing out of the ordinary, except Arjun Rampal who looks completely different and nails the gangster look. Farhan Akhtar too, plays a cameo but it is Arjun who shines. The film shows the gangter's family life and his loyalties, something which is a bit of a letdown.